Fourteen years ago, equipped with my Masters degree in Journalism from Rhodes University. I moved with high expectations to Cape Town with only a volunteer job and an interview. 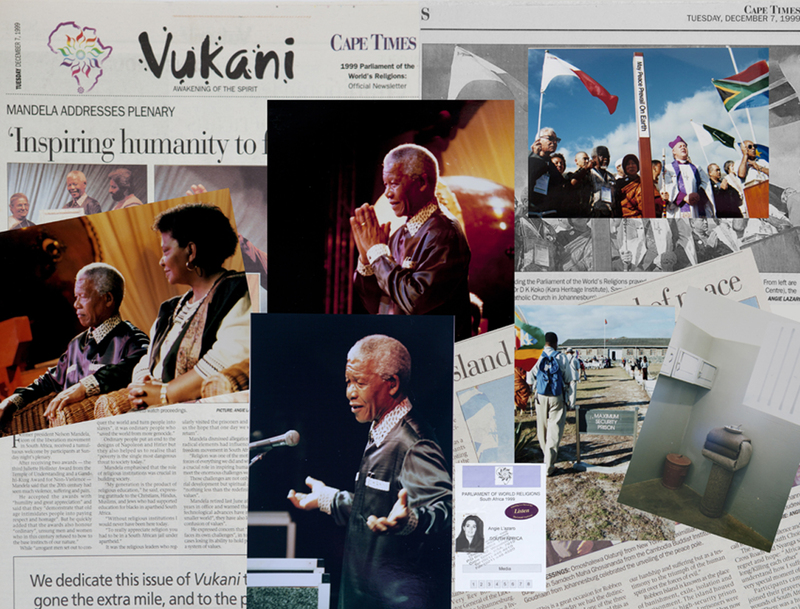 My task as a volunteer was to run the daily Vukani (Awakening the Spirit) newspaper, which appeared as an insert in the Cape Times. It reported on the 1999 Parliament of the World’s Religions’ weeklong events. A few days into editing, writing and shooting for Vukani, I went to the unveiling of the Peace Pole on Robben Island. “The Sunrise Peace Pilgrimage” started early on the Sunday morning. I boarded the ferry and watched Table Mountain recede; the choppy seas finally took me to the surprisingly barren looking island. Before the peace pole was erected I visited Mandela’s prison cell, it was small, bleak and so empty – almost hollow. It was incomprehensible to even imagine what it may have been like to have spent 18 years within those prison walls. The Peace Pole with the words: “May Peace Prevail on Earth” in English, Zulu, Xhosa and Afrikaans was blessed and was witnessed by more than 300 dignitaries. That evening I arrived early at the Good Hope Center Arena, along with an array of newspaper photographers. Nelson Rolihlahla Mandela would address the plenary and was due to receive two awards that night. We were told that only two photographers would be allowed backstage. The excitement was palpable. I was taken aside by the organizer and asked if I wanted to shoot backstage. The other photographers were not impressed as I was unknown in the newspaper world. Mr Mandela arrived backstage with his bodyguards, I asked the organizer if I could meet him. The bodyguards were relentless and would not let us near him. I spotted Ebrahim Rasool (ANC’s Western Cape leader at the time), I had had a good interview with him the previous day, so I decided to ask him to introduce me to Mr Mandela. He swiftly took my arm and ushered me past the staunch bodyguard. There I was in-front of ‘Madiba’, he shook my hand and we chatted. I had him all to myself for a few minutes; it felt as if time stood still. It was dark backstage but his presence filled the space. The rest of the evening was a blur, I photographed ‘our’ hero but my student-equipment felt inadequate. I was the only backstage photographer that day. The morning of December 5, 1999 I visited Mandela’s Robben Island prison cell, by the evening I shook his hand and 14 years later to the day, I am saddened to say: “Good night, Tata”. This entry was posted in Behind the Scenes, Events, Photography and tagged Madiba, Mandela, Nelson Mandela, Parliament of the World's Religions, Peace Pole, photography, Robben Island, South Africa. Bookmark the permalink. Great Story. What did you say to him? He did most of the chatting, he complimented and thanked me on the work we were doing with the Parliament of the World’s Religions and how important it was. He was very gracious, kind and so humble.